[CONT]:Sentinel (You may only have up to four cards with "[CONT]:Sentinel" in a deck) [AUTO]:[Choose a «Royal Paladin» from your hand, and discard it] When this unit is placed on (GC), you may pay the cost. If you do, choose one of your «Royal Paladin» that is being attacked, and that unit cannot be hit until end of that battle. What's up, you guys?! So after talking to Pojo, I kinda figured out that that Wingal from the other day was actually part of a top list on another site which was dated for 2011 as are both today and tomorrow's cards...so I guess Wingal regular was on purpose...moving on! 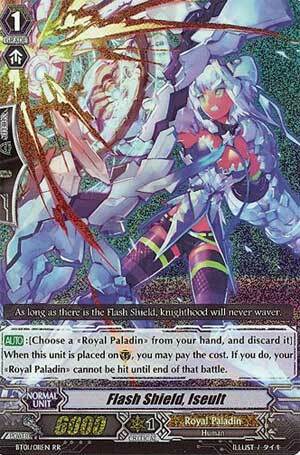 [AUTO]:[Choose a «Royal Paladin» from your hand, and discard it] When this unit is placed on (GC), you may pay the cost. If you do, choose one of your «Royal Paladin» that is being attacked, and that unit cannot be hit until end of that battle. ...this was only the 19th best card in 2011?! Unacceptable! Back then, cards like Iseult were pretty rare as Set 1 only had Sentinels/Perfect Guards for 3 Clans: Chocolat for Oracle Think Tank, Barri for Kagero and her, and back then, it was optional to have Perfect Guards as attacks werent as threatening or overwhelming as they are now. Nowadays, Iseult and every other Sentinel/Perfect Guard is essential in just about every deck as it can help nullify either a powerhouse attack or one with a crazy amount of Criticals on it. Either way, it's made to be an excellent lifesaver, and seeing how most top decks play 3-4 copies of their Sentinels, it shows. Next Time: Does the body good...and the Vanguard.